I am so happy with this new quilt! 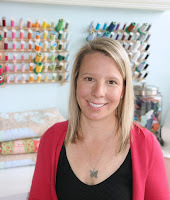 Amy at Creative Sides is hosting the Bloggers' Quilt Festival this Spring....GO CHECK IT OUT by clicking on the button below! 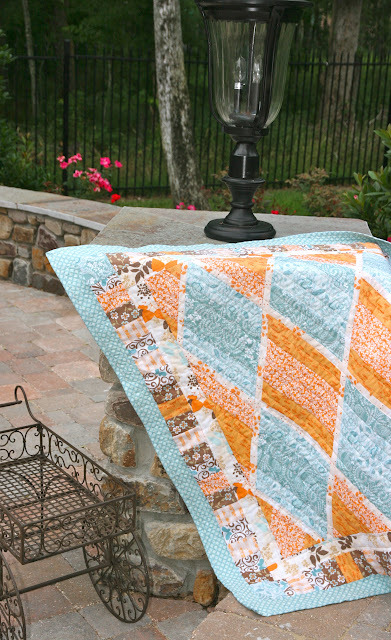 There are some absolutely STUNNING quilts that can really give anyone some inspiration! Now to the introduction to my last minute submission to this festival. Last year, we put a pool in our backyard. After living in the Houston area for 8 years, we realized we could no longer survive one more year in the abominable heat without one! When we designed it, we included a special tile in memory of our daughter, Jamie Lynn. This spring, I was sitting on the "beach" with our newest addition thinking of her as I looked at her "feet" on Mother's Day and discovered that I really loved the color that the blue portion of our pool is. I have been rattling color ideas for our backyard furniture and it all of a sudden hit me! I would emphasize the already orange accents (see the orange/rust colored cushion?) with the blue color of our pool!! 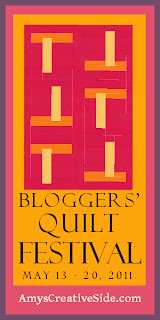 Of course, my inspiration portion of my brain kicked in and immediately thought of a making quilt. I wandered into my studio and discovered that I had Jelly Rolls in the colors I wanted to do. How convenient that I would think of this in time for the Festival! Don't you love when things just fall into place! So I went to work this past weekend and finished the top. In true Heidi-fashion, I finished this late last night burning the midnight oil. Not my best quilting job, but it will do. And I swear, the quilt just looks wonky from this angle. It really isn't THAT bad. Perfect, NO! The fence is actually lower than where I was standing. I hate when a photo makes something worse! 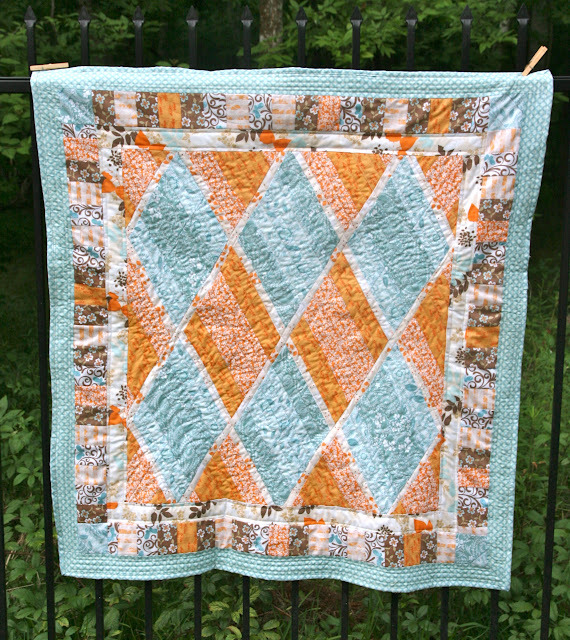 Why do I love this quilt? I love it because I was able to actually do it on my boys' sewing machine (only has straight and zigzag stitch) while my sewing machine is in the shop again. I love that I was challenged that way! I love that it was made from fabric I already had on hand. I love that it will be the springboard for the rest of my outdoor furniture fabrics. And I love that every time I see it or use it, it will remind me of my darling daughter! I have been having trouble sewing off and on anything since the fatal diagnosis of our daughter. But I had a realization that I could either sit around and waste the rest of my life in a pile of grief, or I could do what she can't...LIVE! And sewing and crafting give my life zest! I couldn't think of a better reason to love this quilt!!! I hope this quilt holds the beautiful memories for you. Love the colors! Very fresh. 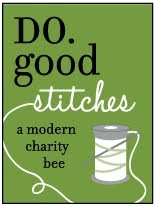 Sewing gets me through some very dark times, hope that it keeps bringing you peace as you grieve. Hi, beautiful quilt. Memories are there to give us sunshine on dark days. Such beautiful colors!! Great quilt! I LOVE that quilt. Gorgeous, Heidi. Just like Jamie. The colours are perfect. Thank you for sharing your story!